It was last minute and my coworkers and I wanted to do restaurant week. I suggested paella – the ultimate warm, comfort food for this freezing New York weather – at Socarrat and my coworkers were pretty excited (it’s not hard to see why when their Restaurant Week menu looks like this). For appetizers we decided on the Ensalada de Kale (left), the Croquetas del Día (at the top), and the Huevos Rotos Con Chistora (below). I was most excited about the croquetas. I had ordered (and enjoyed) the croquetas each and every time I came in the past. The Ensalada de Kale ended up as disappointing as the description sounded. The description read, “Goat cheese, walnuts, beets, dried cranberries.” The beets and the cranberries in addition to the goat cheese made it almost into a vegetable dessert (that is not a compliment). I definitely wished we had ordered the shrimp instead. The Croquetas (with chorizo) were absolutely delicious. The menu’s description is mysterious and alluring, “crispy and creamy chef’s selection croquettes.” I mean, how can you not order that? But what was most surprising (and satisfying) was the last appetizer – the Huevos Rotos Con Chistora. The official description reads, “broken eggs, chistorra, fries, green peppers.” But I don’t think that description does it justice. If this is not on the regular Socarrat menu, they should put it on there ASAP. This would be my regular order, along with the croquetas every time. For the second course, unless you have an even number, you only get the choice of one paella (you need a minimum of two orders) to share. Carne paella was a no-brainer because there is no way “short ribs, chicken, chorizo, mushroom sofrito and snow peas” can lead to bad dish. We were pleased to find that the dish was extremely flavorful, despite the competing proteins and the pan was hot enough that a generous amount of socarrat formed at the bottom. We were, unfortunately unable to finish the paella, but believe me, we wanted to (or I wanted to, at least. Maybe I shouldn’t speak for my friends). We had a choice of two desserts, Flan (left) or “Churros Sunday Funday” (right). I was torn between the two for completely different reasons. 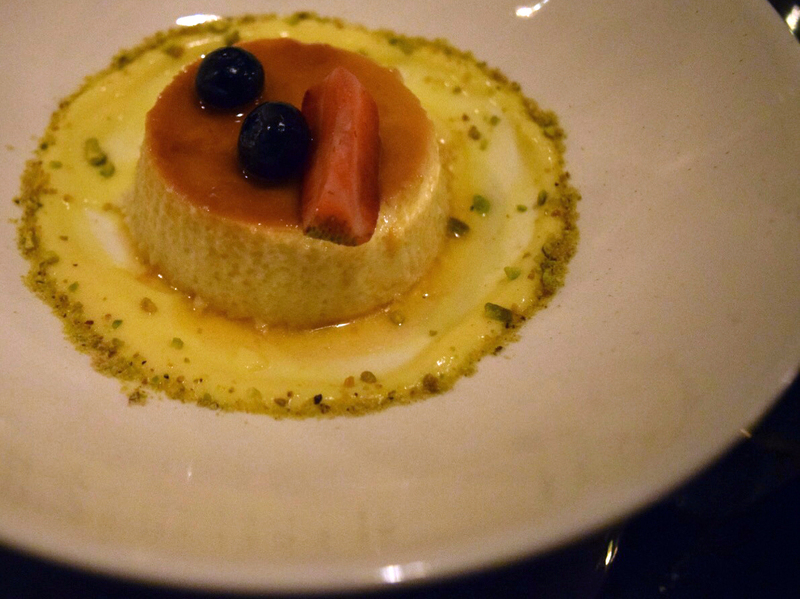 The flan was described as a “condensed milk flan, passion fruit cream, pistachio crumbs” and was completely underwhelming. Though they got the consistency right, the flan was tasteless and the caramelization on top did nothing for it. The passion fruit cream clashed with the underwhelming flavor of the flan, making for a jarring and unpleasant experience of fruit and cream. And I have no idea why they thought to add the pistachio crumbs or fruit on top (they were probably attempting to add texture). My coworker was nice enough to trade her flan for my churros, but we found that both dishes were equally disappointing. 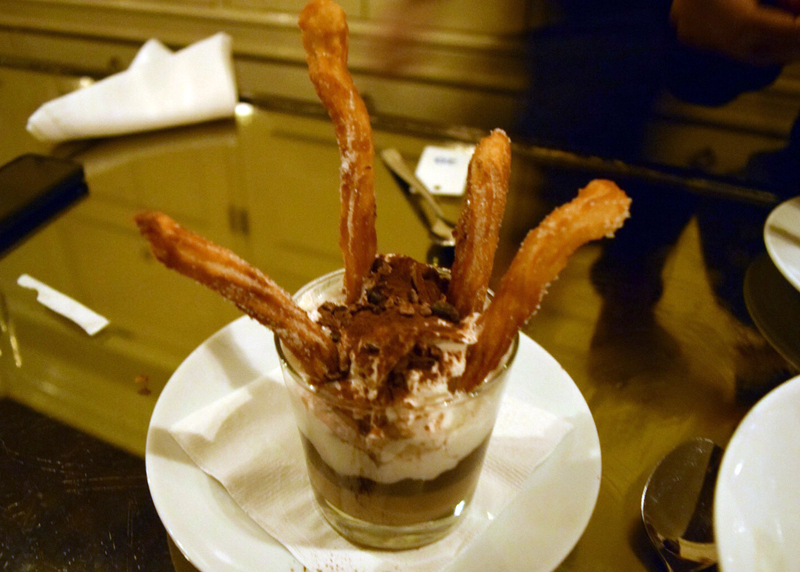 The churros were hard instead of doughy on the inside, and were not sweet enough. The coffee cream/hot chocolate mixture was bitter and overpowering and altogether unpleasant. I don’t know if Socarrat prefer to send out dishes that are hardly sweet and either overpoweringly bitter or sour but they should probably reconsider the execution or concepts of these desserts. They were complete and utter disappointments (and this is coming from a person who will always order dessert). So I don’t know if the $38 plus tax and tip ended up being worth it. But, alas, I will be back because the croquetas, huevos, and paella more than made up for it. I just won’t go during Restaurant Week. Or order dessert.